As it is nearly December, I think I can set up a more en detail plan of what I’d like to accomplish in 2016. And then update it throughout the year so that I can have a nice and tidy progress report in December 2016. _ I reference to this huge graphic of Pazuzu and her children I now accepted my fate that I will never be able to not have them in dollform. Especially not now that I have grandchild no. 1 aka Theodore. HOWEVER I will try to not buy them all as MSDs cause dear god, the space that’d take. But I figured, hey, why not buy them as Littlefees and have them all share a body (together with Theodore, Harbinger and bb!Kimete)? Faceplates are easy to store! Plus, apart from the twins, no one of her children were little when the others were born but were already adults. Solely for the twins I’d need a second body to be able to take pics of them together but eh, works. 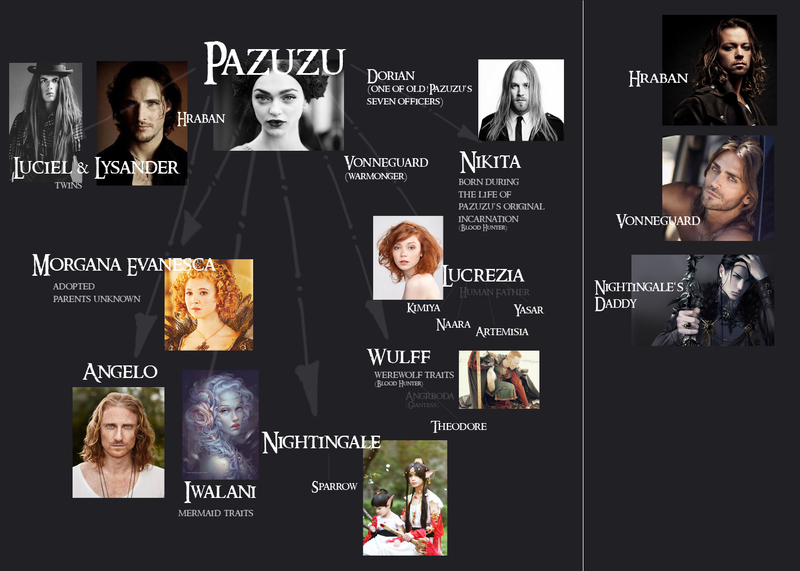 I also would like to find better names for „Angelo“ and „Nightingale“ (and maybe „Lucrezia“). Most recently I switched Wulff to Wulfric and I really prefer that (Luciel & Lysander used to be Lucifer & Loki and Iwalani was Iruka and dear go no). And then decide if Nikita is male or female. Or just genderfluid cause fml I can’t decide (s/he was both already). Kabira is already with me as a D.Marcia. _ Hope for Twigling to release her MSDs to use one as the human part for my Yul Satyresse centaur body. Find a name for her. _ Acquire a Cerisedoll classic body for Grendel. _ Furniture. Not much cause space issues but an oriental bench for Khaled (found a gorgeous one which is 200 bucks which explains why I don’t have it yet) and I want a simple throne-thingie for Pazuzu. _ Wigs for everyone who needs them (means Alpaca or Angora). _ Get everyone’s weapons finary. _ Buy four of the IKEA MALM dressers to go under my cabinets. Plan is to store the doll clothes under their respective cabinets and use the dresser under the Blythe cabinet to store loose doll parts (the Blythes have an etra huge drawer for their clothes, they have more as they are not restricted to commissions only). _ CLOTHES SO MANY CLOTHES. I’ll just import Nezumitoo to Germany kay? _ Finish the two dioramas. _ Decide if I want to keep the big dollhouse or not or if I want to replace it with that adorable other house I’ve been lusting after. _ Try to see if a Vinter Arden, a Miss Retro Mama, a PD Ebony, a PD Ginger and a Star Dancer can be acquired for cheaps. _ Upgrade my camera. Or not. No clue, I am strangely attached to my dinosaur and I finally feel as if I am finally getting the hang of this photography business. …my Blythes will be so neglected in 2016. Your plans look great!! I really like the idea of having LTF sharing a body, that way you can easily have several characters! BTW, I added you button to my blog! (I asked on Flickr!) Please check it out! It is on the bottom on a carousel (you can drag it). Let me know!